Remarks by H.E. 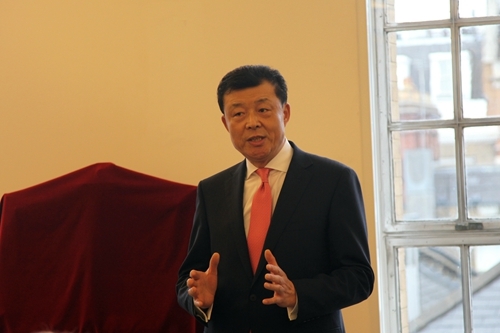 Ambassador Liu Xiaoming At the Opening of the London "China Exchange"
It is a great pleasure to attend the opening of the London "China Exchange". I want to thank Their Royal Highnesses for their presence today. Four years ago, I joined The Prince of Wales at the opening of the Confucius Classroom in Llandvery College. It seemed as if it were yesterday. I remember His Royal Highness said "Wales welcomes you" in perfect Chinese. Thank you, Your Royal Highness, for your long-standing support for closer cultural and educational exchanges between China and the UK. I also want to congratulate Sir David Tang and the Prince's Charities Foundation. I congratulate you on your highly effective efforts in the protection of the hutong and traditional Chinese architecture. Chinatown is one of London's best known landmarks. 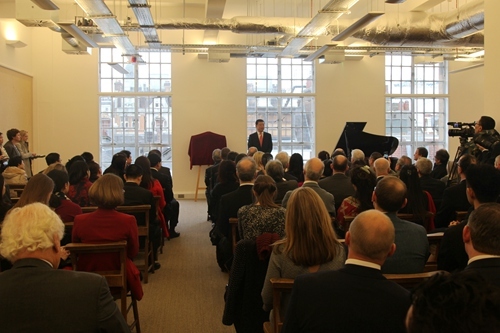 Here today, with the opening of the "China Exchange", you are exploring new ways and making new efforts to promote China-UK two-way cultural exchanges. Today is the very first day of the Chinese Year of the Sheep. In the Chinese culture, sheep symbolizes good health, gentleness and perseverance. This Year of the Sheep is also a "big year" for China-UK relations. It will witness a series of good, happy and significant events. There will be unprecedented opportunities for China-UK relations. I hope and I am confident that in the Year of the Sheep, China-UK comprehensive strategic partnership is sure to make greater progress, and China-UK cooperation in various areas is sure to bear rich fruits. In closing, I wish you all good health, happiness and every success in the Year of the Sheep.